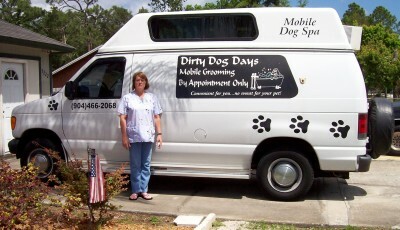 Dirty Dogs is a mobile dog grooming service serving Jacksonville, FL and surrounding areas. Locally owned and operated by Rita Moore, a Jacksonville native with decades of experience, Dirty Dogs is different than other Jacksonville mobile dog groomers because of the convenience we offer, the expertise we can deliver, and most of all, we truly love what we do and we understand that your pet is part of your family and we put them first. Our cleaning vehicle is fully equipped with the latest dog cleaning technology and our friendly staff will go the extra mile to make sure your pet is as comfortable and happy as possible. Please navigate through our site using the links to the left to learn more about us, then contact us to schedule a cleaning. Thank you for using Dirty Dogs and we look forward to working with you and your pooch! The owner agrees to give a 72 hour cancellation notice of any appointment, failure to do so will result in a $40.00 missed appointment fee. The owner agrees that if they do not book on a regular basis, call appointments will be an additional $20 fee.